Where in the world is everyone? Which countries do people live in, globally? It’s a very simple question, but it’s also hard to get an accurate sense of the answer by browsing through a lengthy table of country-level population data. That’s because there are close to 200 countries spread around the globe, with populations ranging from near 1.4 billion (China or India) to countries a mere 0.001% of that size. How is it possible to do the mental math in interpreting such a wide range of data points simultaneously? 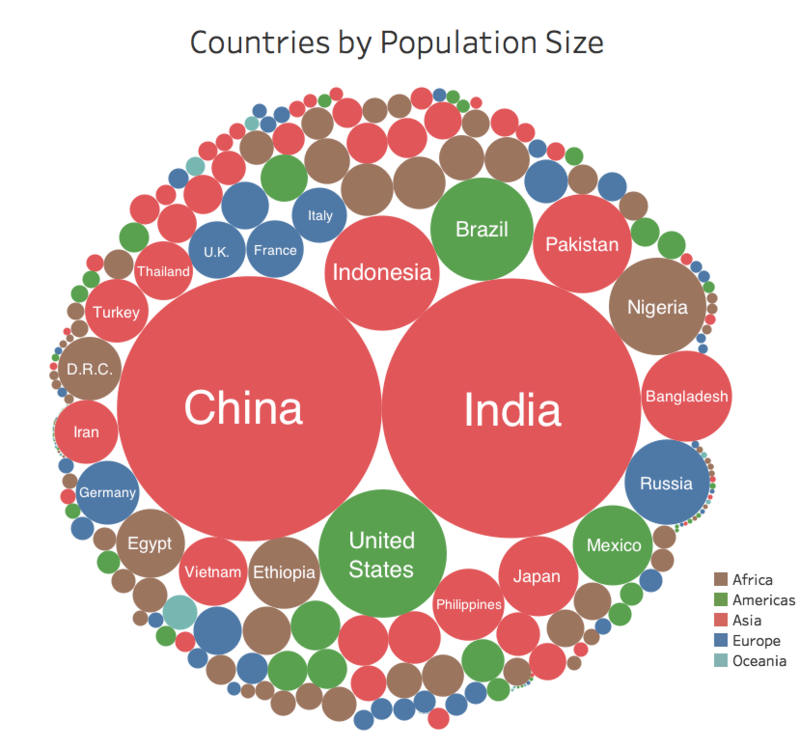 Today’s data visualization comes to us from PopulationPyramid.net, a fantastic resource for data on global population numbers. It allows us to see the location of the world’s 7.5 billion people by resizing countries based on their populations and then coloring and organizing them by region. This simple application of data visualization makes it more intuitive to comprehend where people live around the globe, as well as how different countries compare in size. The first thing you might notice on the graphic is the relative size of regions, with Asia taking up a whopping 60% of the visual space. When you look at it this way, you can really see how the math breaks down. About 75% of people reside in Asia or Africa. Meanwhile, the regions of Europe, North America, South America, and Oceania just total together to 25% of the mix. There are some countries that are clear standouts on the data visualization. For example, China and India combine to 2.7 billion people, together accounting for 36% of the total global population. The United States, Indonesia, Brazil, and Pakistan rank between #3 and #6, and have about a billion people between them. Nigeria, which is #7 on the list, has the world’s fastest growing megacity within its borders. Further, Bangladesh is also a noteworthy entry since it is one of the densest populations globally, with 1,138.9 people per square kilometer of land. While this uses slightly older data, it is still interesting to see how data visualization can help us understand a complex and wide-ranging set of data that is relevant to everyday life. This article is published in collaboration with Visual Capitalist.